Norwich University – Online MPA, 100% online, no GMAT or GRE required. USC’s Online MPA Program – Earn your MPA online from USC Price, ranked #3 for public affairs. Johns Hopkins AAP Online Programs – 6 specializations: NGO, Public Management, Government, Global Security, more. George Washington University – Online MS in Political Management, 100% online, no entrance exam for qualified applicants. Deciding to enroll in an Online MPA program is a great choice. 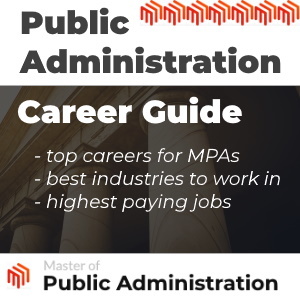 Public administration has various implementations in businesses, non-profit organizations, and public service organizations that can potentially provide for lifelong, satisfying careers. When you are searching for the right online program, you may find that the choices can be overwhelming, since there are a multitude of options available. Our goal is to provide you with support during this process and provide reliable and researched results that you can count on. Our experts have scrutinized the various Online MPA programs available to assist you in choosing the right university. We took different things into consideration when making this list, including the reputation of the university as well as the basic requirements of each university for acceptance. There are several different factors that come into play when choosing a degree program, including the reliability of the degree program, the costs, and the amount of time it takes to complete. check_circle Online No GMAT or GRE Required Graduate in as few as 18 months. Eight concentrations to choose from: Criminal Justice & Public Safety, Fiscal Management, International, Municipal, Nonprofit Management, Policy Analysis, Public Administration Leadership & Crisis Management, Public Works and Sustainability. check_circle Online Ask representative. Bachelor’s required. Learn to design and run new public systems and programs; evaluate, develop and implement new policy; and track, allocate and raise public funds. Graduate in as few as 24 months. check_circle Online GRE Waivers available Complete in as little as 18 months, includes a Practical Work Experience practicum at a public service organization. check_circle Online Ask representative. 100% online MS in Political Management program, no entrance exam for those that qualify. Earn a GW degree in as few as 18 months. Browse some of the top online MPA programs below to get a good idea of your choices prior to enrolling. As with any rankings list, this is a subjective list (though we did our best! ), and you can view our methodology below. Earn a top-ranked Master of Public Administration online from UNC-Chapel Hill without relocating. MPA @ UNC can be completed in as few as 18 months and no public service experience is required to apply. Advanced degree GRE waivers are available to those who qualify. Earn your MPA online from USC Price and learn to design and run new public systems and programs; evaluate, develop and implement new policy; and track, allocate and raise public funds. Graduate in as few as 24 months. Bachelor’s required. The Master of Public Administration program at Norwich University can equip you with the skills necessary to become a more effective leader and make a positive difference. Graduate in as few as 18 months with 100% online coursework and no GRE or GMAT required. Choose from one of eight concentrations which include Criminal Justice and Public Safety, Policy Analysis and Analytics, Nonprofit Management and Public Works and Sustainability. Earn a master’s degree from a top-ranked school for public affairs. 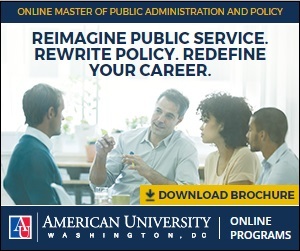 American University brings DC to you with the online Master of Public Administration and Policy (MPAP), combining our nationally recognized and NASPAA-accredited Master’s in Public Administration (MPA) and Master’s in Public Policy (MPP) degree programs into one foundational, highly marketable credential. Click here for more program information. UNC – Chapel Hill’s Online MPA degree program is ranked among the best 25 public administration programs in the nation. This program seeks to prepare learners leadership roles in both governmental and business positions. Through this online degree program, students can learn and prepare for leadership positions in various sectors of local government, national government, small businesses, and major well-known businesses. The Online MPA program at Southern California integrates the necessary elements of all related discipline to help provide a great understanding of leadership and management that is needed in public administration. Since public administration is a multidisciplinary topic, this university caters to the need for a diverse, yet structure curriculum. Texas A & M University claims that a degree from their university can set learners apart from the rest in the working world. This online degree program offered by this school requires a 2 week residency within the 2 year program period. It also allows for students to choose from 3 different tracks – Homeland Security, Non-Profit Management, or Public Management. Tuition: Costs vary – School advises prospects to call for a recent quote. UCD provides students within an Online MPA program that allows for them to continue working or managing a busy family life. This university offers reasonable options for in-state and out of state students, which is a great option for students from across the country. UCF’s Online MPA program is designed to cater to future non-profit and public servants. This program seeks to increase overall leadership and management skills for individuals on this track, and is a great choice for students that want to get the most out of their degree program. The University of Illinois-Springfield sets itself apart from other universities in that it drives focus away from standard educational experiences. This university wants to provide the Online MPA program to students that want to design their own schedule to fit their lifestyles. The goal of Villanova University’s Online MPA program is to prepare and create effective leaders and managers in non-profit and public service organizations. Students that want to know the ins and outs of ethics and how they are properly applied in the public setting are great candidates for this university. Penn State has recognized the need for knowledgeable and reputable leaders in the public sector. In response to this need, this university has provided a reliable and relevant MPA program to truly test the skills of students involved. If you want a challenging degree program that is worth the effort, than definitely consider Penn State for your Online MPA program. This university focuses on the interdisciplinary approach to training great leaders for non-profit and public entities. Using a blend of research and public service capacity, this university provides students with different perspectives that can provide for a great foundation for leadership positions. Northeastern University claims that their Online MPA program is no different in consistency than their standard in-person program. This university has worked hard to ensure that their Online MPA program meets national standards, and provides students with everything needed to be knowledgeable and valid professionals in public service. Determining a “top online programs list” can be a very subjective determination. As with anything, you are responsible and should do your own homework on any program you consider for your online MPA. We asked the following questions when determining this list: Is the MPA program online? Does the university utilize the same faculty for the online MPA as they do for their on-campus MPA? What is the focus? Are there multiple tracks? How long has the MPA program been in existence? What is the program length and tuition costs? What is the brand equity of the university? Is the program accredited? How usable is the website? Is the information on the website helpful for a prospective student? This list is subject to change, and likely will throughout the year. As universities continue to grow their online presence, more could be added to this list.